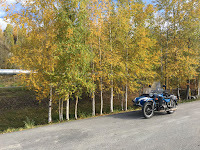 The Ural National Rally was today (Saturday, September 9th) and, no, I didn't participate. In fact, I never bothered to register since I wasn't sure if the rig would be on the road. But I did manage to get the Ural out and about a several times. It was too nice of a day to not test the transmission. After morning coffee and a stop at the Farmer's Market, I noticed a slight loss of power on hills. It was then that I remembered that before pulling the transmission, I made a point of using up most of the gas in case I needed to remove the tank. A quick switch to reserve solved the loss of power on hills. Later on in the day, I went out in search of evidence of Fall and I'm afraid that I found plenty. We really don't have a lot of Fall colors around here besides yellow. Unless brown qualifies as a color. There is very little red except on some bushes. This picture was taken at the park in the Goldstream Valley. I then continued east towards the pipeline turnout on the Steese Highway. I thought that the trees would be more yellow. Maybe in a couple more days. I was reminded by a whining/spinning noise that I probably need to replace the bearings in the alternator drive. It's a pretty simple procedure and I believe that the bearings are available at Napa. I had helped JedR replace the bearings on his newer Ural. I think that they are pretty similar. I then headed home as I was going to make pizza tonight and needed to start on the dough. I am surprised you found so much yellow on the trees. Fall is coming. 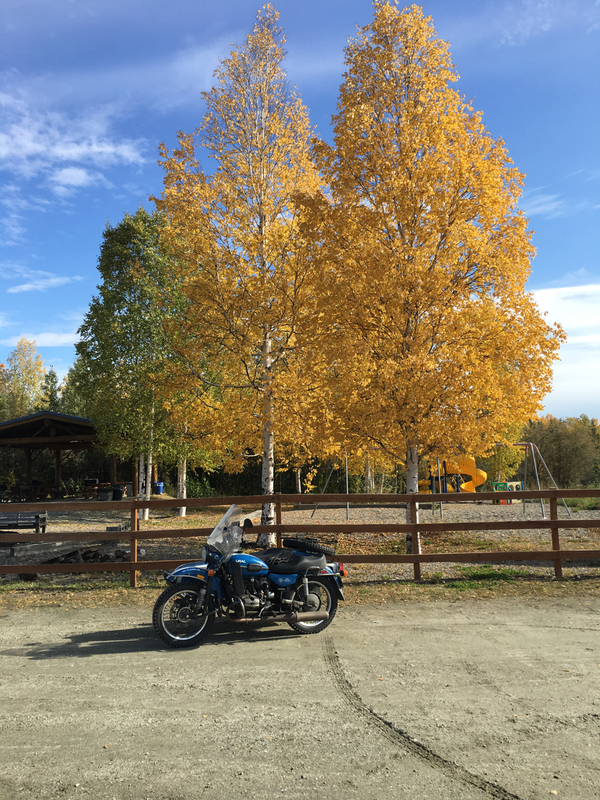 Glad the Ural is running too. Even more yellow one the trees today after only one additional day. We are actually supposed to see rain this afternoon and it is forecast to stick around a few days. Fingers crossed it will. Great to see your rig out and about...Fall colors are starting to be reported in the mountains...I hope I scheduled my trip for Fall Colors pictures for the peak of the season. The rig seems to drive better now than before but maybe that's all in my head. As far as the peak leaf viewing, if you miss the date, there's always next year.